1784 Carte des Isles Sandwich - the Vintage Map Shop, Inc. This is a high quality reproduction of one of the premier maps with regards to the history of Hawaiian cartography. This particular example was featured in "Troisieme Voyage de Cook ou Voyage a l'Ocean Pacifique..." Many subsequent maps of the Hawaiian Islands were ultimately based off this example which was prepared by Lieutenant Henry Roberts though credited to James Cook. 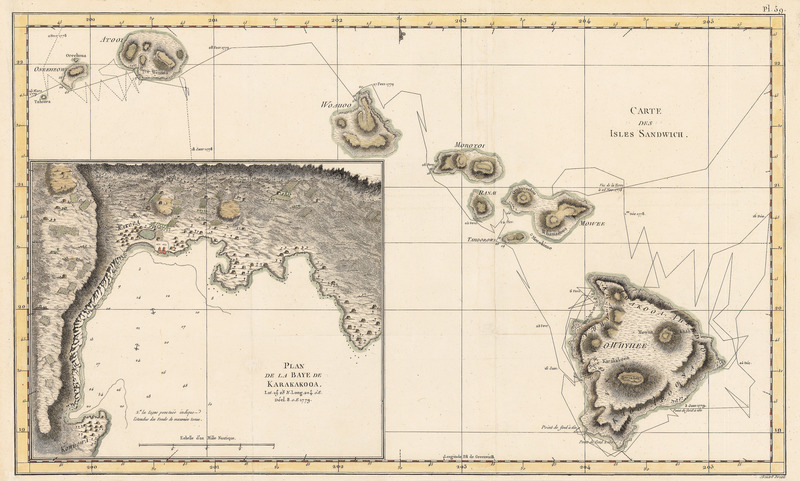 The map displays the routes and discoveries of the Resolution throughout the islands which are wonderfully engraved with attention to topographical detail. In the lower left corner of the map is an insert of La Baye de Karakakooa (present day Kealakekua Bay). The insert includes the anchorages of the two ships navigational hazards palm trees houses and farm fields. This is where James Cook spent his last few days before being killed in a confrontation with the native Hawaiian people.